The ALEH network for special children last week began the new year by dedicating a new school for its children in Jerusalem. Israel's largest network for children with severe physical and cognitive disabilities last week began the new year by dedicating a new school for special students in Jerusalem. The dedication ceremony, held to mark the establishment of its new school, was attended by Jerusalem Mayor Nir Barkat, U.S. 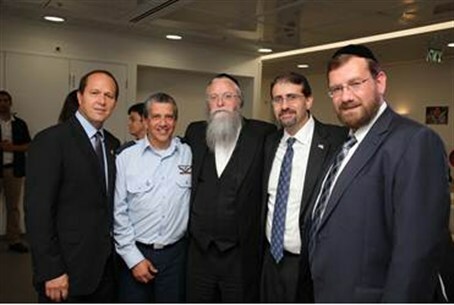 Ambassador to Israel Dan Shapiro, Israel Air Force Commander, Maj.-Gen. Amir Eshel and former IDF Chief of Staff Lt.-Gen. (ret.) Gabi Ashkenazi. The new school is expected to provide enhanced special education and rehabilitative programming tailored to each child's needs, the organization said in a statement. ALEH provides round-the-clock rehabilitative and medical care for 650 children around the country in four residential facilities. At present, 73 special needs children from the Jerusalem area, ages three to 21, are enrolled at the school, which includes a paramedical wing, 11 classrooms, several treatment rooms, family quarters, an activity area and staff offices. "The school was built on a separate floor, distanced from the living area, so that the ALEH children could learn in a different environment than their living quarters – so that they, too, could feel like they leave home for school every morning, just like other children," said Rabbi Yehuda Marmorstein, director general of the ALEH center. "Implementing the 'normalization principle' will significantly improve the quality of life of ALEH's children," he said. "Every person, no matter their level of disability, has a natural right to dignity, the highest quality of life and to reach their fullest potential in a loving and supportive community. This new school will help the student advance and grow to live a happy, dignified and meaningful life."